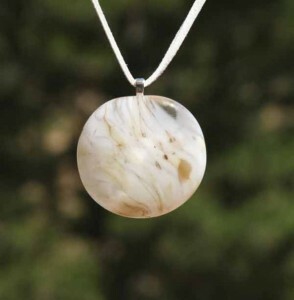 Recently, and from multiple sources, I've gotten urged to use our glass work in jewelry. So I did a little research online to see what type of glass jewelry was already out there. We don't particularly like doing the same thing that hoards of others are doing. We like having our work be unique. I found a lot of various necklaces, etc, but none of it really looked like the type of designs that we would/have come up with. I quite enjoy mixing little pieces in when I'm working on huge projects. They let my brain rest from the big stuff and I can really dive into myself and enjoy the process of each, big and little, much better when I'm bouncing from one to the other. Of course, the huge project we're just finishing is the Blown Glass and Carbon Fiber Orrery. While I like to bounce to and from project, the main ingredients usually stay similar or the same. We decided to keep with the Planet theme as we moved into the jewelry. What came out? 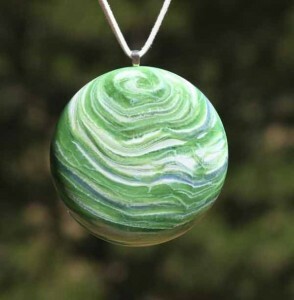 Planetary Pendants! 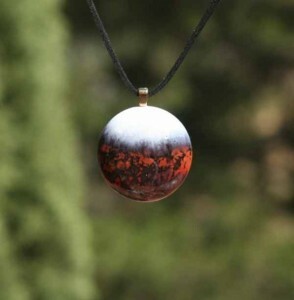 Using the blown glass techniques we used to make the gorgeous little micro planets, we made the first in a continuing series of necklaces of the solar system. I don't think that Mercury will be much to look at, but Saturn, with its pale storms and Jupiter with its rugged storms will be very fun for us to work on. Those will wait for a future post. 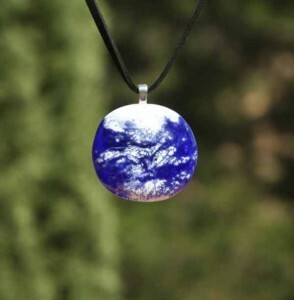 If you're interested in showing your love for your favorite planet by owning one of these beauties, please drop me a note. They will soon be posted on Glass Sculpture.org, but as they're so very new, they're not there yet. They are all in the $35-$65 range. Very affordable, unique and gorgeous.